Increase your reach and attendance with a virtual conference experience. Virtual conferences are evolving, they’re cost-effective, and they extend your most compelling content to your entire community. We prioritize the needs of the online attendee. We don’t merely have them looking over the shoulders of onsite attendees. Instead, we strategically integrate and immerse them into the entire virtual conference experience. Your entire community can be reached: online attendees, exhibitors and sponsors. We begin early, building community around conference topics and continue discussions long after the program ends. Online conferences can reach deep within organizations and impact a larger number of participants. Traditionally, only a select group of individuals are allowed to attend in-person events. A virtual conference on the other hand, brings the entire conference experience directly to anyone with a PC, tablet or smart phone. Create a home for your event that includes access to sessions, faculty pictures and bios, discussions, resources, chat, social media and sponsors. Add a virtual tradeshow to generate additional participants and revenue from your industry participants. Include your organization’s branding and imagery. Create topical or session forums to encourage active participation. Schedule live chats as overtime sessions for your most compelling speakers and topics. Support one on one connections through member matching. Each booth can include a video presentation, literature, live chat, messaging and the organization’s Twitter feed. Exhibitors can design their own booth or our staff to design it for them. A secure login is provided to each exhibitor to add content or make changes. 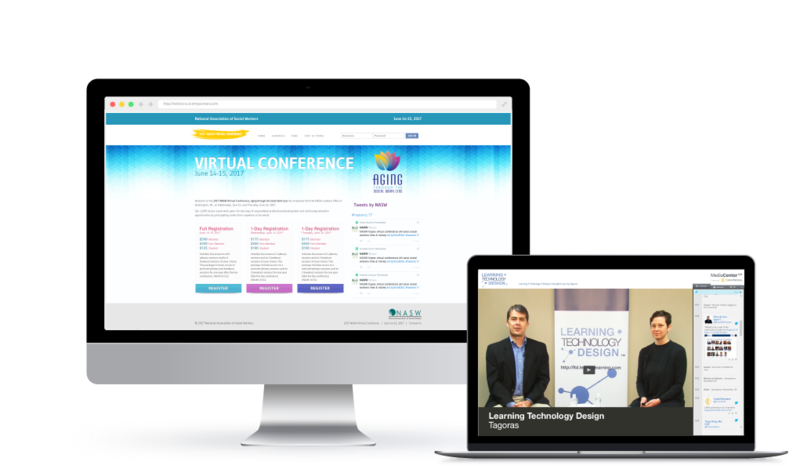 Utilize our multimedia webcast and virtual conference platform to livestream your keynote and plenary presentations. Include breakout sessions, all managed by our experienced event producers. Organize by learning tracks designated by visual cues. Create a rolling slideshow of participant groups. Allow attendees to login to sessions with their social media credentials so their pictures appear next to their chat. Include a town hall discussion with thought leaders in your community. Create revenue opportunities through attendee fees, sponsorship and exhibitors. Attract participation groups that bring new participants into your community. Create greater relevancy by bringing your most valuable content and networking to those that can’t travel.